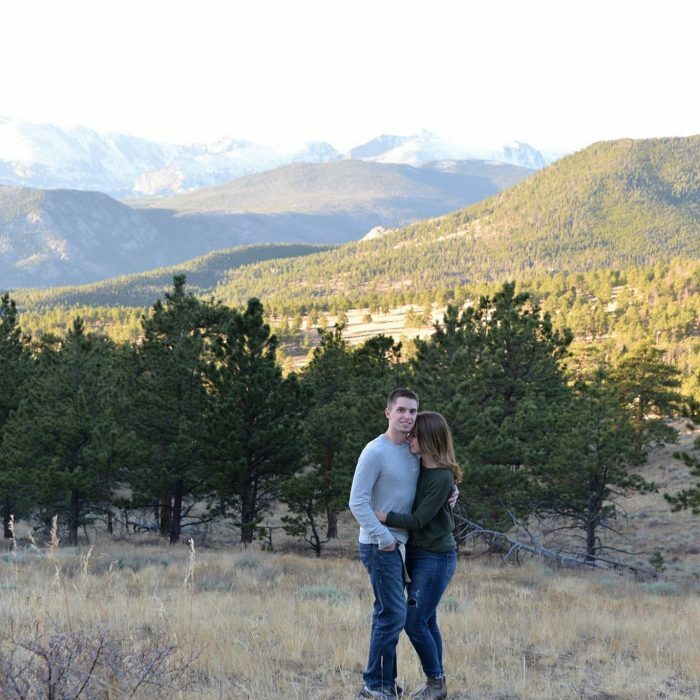 Chelsea and Will's Proposal Story! 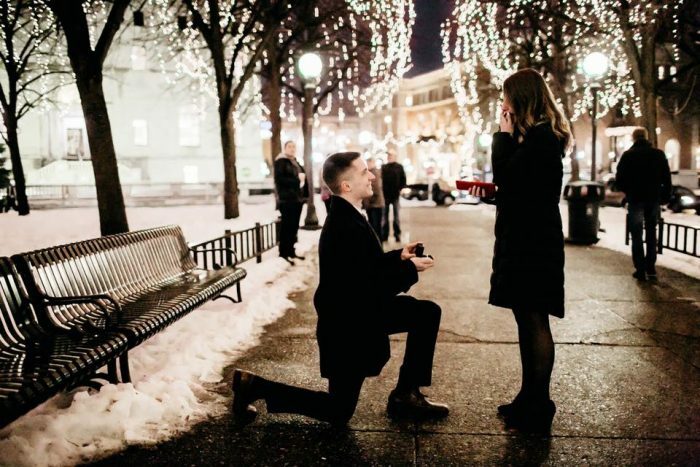 I met my now fiancé when I was 13 years old. Will was always apart of my group of friends but always kept to himself, he was known as the nice guy. When I was 16 years old I attended a football game that my best friend always hosted, they were always a blast and I love the sport! The ball landed near my feet and I threw it to my friend who was playing quarterback. Will was near by and complimented my pass, which for some reason all those years I’ve known him I got major butterflies. So I decided to be receiver in the next play, and when I threw the ball it was my worst throw I have ever done. That’s why you never show off to a guy who actually plays the sport. After the game ended I went home and all I could think about was Will, how kind he was, and how he noticed my pass! The next school day after English class(He was in my class), I approached him and started the conversation about football, I didn’t know what else to talk about. He walked me all the way to class and he wouldn’t stop talking! Which amazed me because he was always known to be quiet, and his next class was on the opposite side of mine. After that he always walked me to class everyday and we got to know each other and hung out every weekend. He asked me out after we slowed danced at the park by my house under the stars, while my Ipod played the music. We had the most wonderful relationship in high school, to after graduation when we became long distance for two years, and now we’re 22 years old. ENGAGED! I was getting ready for a family dinner that Will’s Grandma was planning the night of December 21st. But what I didn’t know is that there was no family dinner and that we would be celebrating our future. Will told me to dress up since it would be a fancier dinner, and to also dress warm. He wanted to go on a walk through Rice Park, which is in St. Paul, to give me my Christmas present. I was super excited because I have never been there and also I love Christmas, and this park was completely decorated for Christmas! The whole car ride we were laughing, and playing our usually game of Score. We arrived at Rice park, which was playing the movie Elf, so there was people everywhere! It was absolutely beautiful, huge trees covered in lights. He stopped me to admire one, and asked me if I was ready for my gift. So Let’s back track a bit, the whole 5.5 years we have been dating Will has always given me hints on each gift he has ever purchased for me, so I thought for Christmas that he bought me a necklace. He pulled out a red velvet skinny jewelry box, and says “you are right honey, it’s a necklace”. 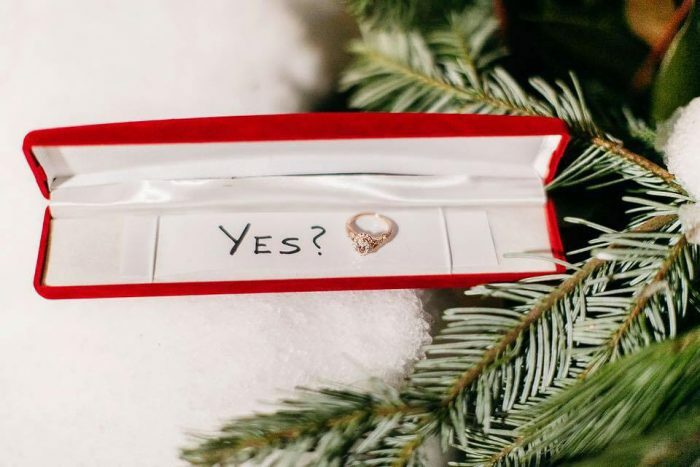 I opened the box with shaky hands and didn’t find a necklace but a slip of paper that said “YES?”. I looked up at him, tears immediately filled my eyes because I knew what he was about to do. Will got down on one knee so beautifully and asked me to marry him. Right in the middle of the park, while Christmas music played, and people cheered for us! I didn’t even look at the ring and shouted yes! I have always wanted to marry him, I have never been so beyond happy in my whole life. He is the most genuine person I have ever met. I hugged him and just cried. Then I heard pictures being taken and to find out Will hired a photographer to capture the whole thing! Plus a photographer who I fell in love with her work. And now I’m engaged to my high school sweetheart!